Resistance bands are a common sight in many gyms and strength training facilities, they come in an array of widths, colors, shapes, and sizes. Unfortunately these items usually just hang on a wall or power rack collecting dust as the days of westside and conjugate style training methods, where these tools were popular, slowly fade from training logs. Also, the diversity of resistance bands, despite the utilitarian nature, is a daunting obstacle for those wishing to give them a try. Many people have no clue where to begin since there is no standardization, meaning different colors and widths are not very telling in terms of resistance. Thus, a lot of trial and error is necessary and many individuals, without the assistance of a coach or trainer, don’t want to bother. However, hopefully after reading this guide you become more confident in their use and either take the plunge to start using them, or as a veteran you decide to reintroduce them to your training. Resistance bands could be used for a number of reasons but one thing is for sure they are going to add (or subtract) resistance to an object, for the sake of argument let’s say a barbell. So if you were trying to make an exercise harder, or even easier, you could look at adding resistance bands instead of more weight plates. This has application for both strength/speed training as well as for muscle growth, let’s look at a barbell back squat for example. You are only as strong as the weakest point in the squat, for many people that is around the bottom. Picture this, you are using the heaviest bar weight possible that still allows for swift, comfortable movement through out the squat for the desired number of reps, but your program/coach requires you to train at a higher weight, what do you do, add more plates and hope you don’t fail? What options do you have? Here is where resistance bands could come into play. Resistance bands increase tension as they are stretched, and if used on exercises where we are strongest in the end range (i.e. the squat) they apply the principle of accommodating resistance, meaning resistance is increasing as we are getting stronger through out a movement. With resistance bands added onto the barbell and if properly anchored to the floor this would gradually increase the load as you passed your weak point allowing you to maintain speed in the bottom and simultaneously overload the top half of the squat. Even if packing on muscle is your goal then resistance bands can still be useful. Still using the squat as an example, we now know that we’re stronger near the top, or you could say the weight feels lighter near the top. By adding resistance bands we’re getting closer to the sensation of constant tension through out the movement and this requires muscles to continue to increase force production through out the entire exercise which in turn leads to greater muscle activation and that can lead to improving gains in muscle size . Attaching resistance bands may require a little creativity. If using a barbell, bands can easily loop around the sleeves where the plates slide on, or if using dumbbells or just “unarmed” like in a push up you could loop the bands around your wrists or hands. Things get a little tricky if using machines because you have to understand how all the parts move, but I still encourage trying none the less. Anchoring the band is a little simpler, if on a bench you can thread it underneath, if standing like for bicep curls you can just step on the band, or just grab the heavy dumbbells that no one uses and they can easily hold the band in place. Bands can also be looped around a power rack of course. However, unlike anywhere else the power rack has the unique ability to let you anchor the band almost anywhere. Utilizing this aspect of the rack is where resistance bands can actually make an exercise easier as I stated earlier. 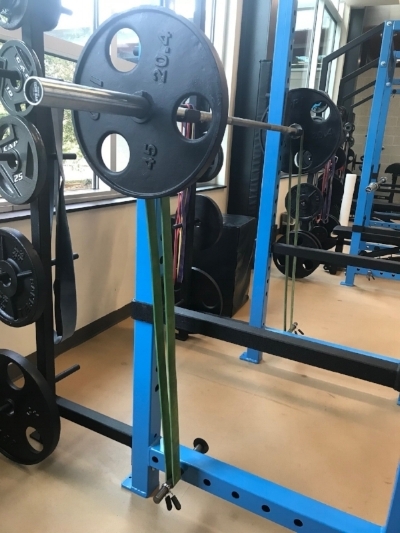 If the bands are looped around a barbell but now anchored above on the top crossbars of the rack, the bands will now work to help lift the weight. This technique is often referred to as reverse bands but still adheres to the same mechanics of accommodating resistance. Back to the squat example, the load will still feel the lightest at the bottom because the tension on the bands is greatest as you descend, and then the load is heaviest at the top as you come up because that assistive tension is now receding. Whether for assistance or resistance both methods are viable ways to use resistance bands, and if you stick to the information in this guide you can’t go wrong by incorporating them into your training. Wallace, B. J., Winchester, J. B., & Mcguigan, M. R. (2006). Effects of elastic bands on force and power characteristics during the back squat exercise. The Journal of Strength & Conditioning Research, 20(2), 268-272.